Hilton Kelley, Jesse Marquez and many more are embracing their hometowns—and fighting like hell to protect them. Other than leaving town, there's one sure way to escape the familiar rotten egg odor of Port Arthur, Texas: head for Kelley's Kitchen. By the time you get there—27 blocks from North America's largest oil refinery—you'll be sniffing the barbecue smell of hope for residents who live at a mostly low-income level in homes huddled right up against the town's many refineries. Smokestacks from some of those refineries, and their plumes of smoke, are visible from outside Kelley's Kitchen, but what you can't see is what's in that smoke—carcinogens like benzene, toluene and xylene, and the noxious sulphur dioxide that gives Port Arthur its trademark stink. It makes people sick and it makes Hilton Kelley mad. Kelley was born in Port Arthur and fled from it at age 19 because, "I always had a sense you aren't going anywhere, you aren't going to achieve anything." After a stint in the Navy, he made his way to Hollywood to become a successful stuntman, working with the likes of Don Johnson and Cheech Marin. Decades and 1,500 miles away from Port Arthur, Kelley had put his hometown behind him—until 2000 when curiosity drew him back for a visit. "I was disgusted with what I saw. Lots of dilapidated buildings, no development, folks complaining about lack of jobs while living on the fenceline of $50 billion dollar energy companies, large numbers of people dying or dead from cancer," he remembers. Kelley returned to California, realizing someone had to do something, and that he was that someone. Across the U.S., 143 refineries pump out more than 22,000 tons of emissions that are known to cause cancer, birth defects, asthma and other health problems. "I decided to come back home to Port Arthur after I had a premonition through a dream. It seemed like I was at a crossroads," Kelley says. He gave up his acting career and moved back to fight for his community, quickly realizing that in order to address the town's social and economic challenges, he first had to fight the environmental injustices. The fight is centered at Kelley's Kitchen, a restaurant he and wife Marie opened up as a warm spot in a forbidding environment—a gathering place for local residents and the many people who eventually came from all over the country to learn from him how to fight for environmental justice in their own refinery-filled communities. Most of those, however, are less afflicted than Port Arthur. Port Arthur is surrounded by eight major oil and chemical industrial sites. In a state that records more than 2,500 toxic emissions events per year, the town is near the top of the list of offending cities. The Texas Cancer Registry shows that cancer rates among African-Americans in Jefferson County, where Port Arthur is located, are roughly 15 percent higher than for the average Texan. Deaths from cancer are more than 40 percent higher for African-Americans. More than 7 million Americans have increased cancer risks from living near at least one of the nation's 143 oil refineries, which release over 20,000 tons of toxic pollutants, including benzene, lead and hydrogen cyanide each year. The deadly toxins are associated with cancer, anemia, asthma and birth defects. 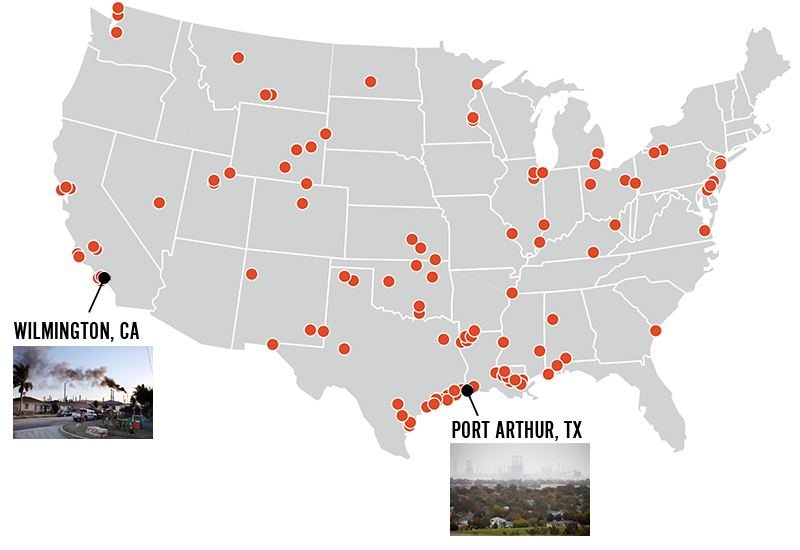 These giant facilities are operating with outdated Clean Air Act protections. The Environmental Protection Agency is more than a decade late in updating many antiquated rules that allow refineries to self-report pollution, avoid regular inspections and operate with outdated equipment. The current rules are insufficient to protect the public health of communities across the country. "That's the day that made me what I am." Like Kelley, Jesse Marquez is rallying residents of his hometown, in Wilmington, CA, to fight for their own safety and welfare. According to self-reported data in 2012, the three Wilmington refineries and those in neighboring Carson released over 1 million pounds of life-threatening toxics into the community. Without air monitoring requirements, it is unclear exactly how much pollution these facilities actually emit, and Marquez and his colleagues expect the real number to be much higher. 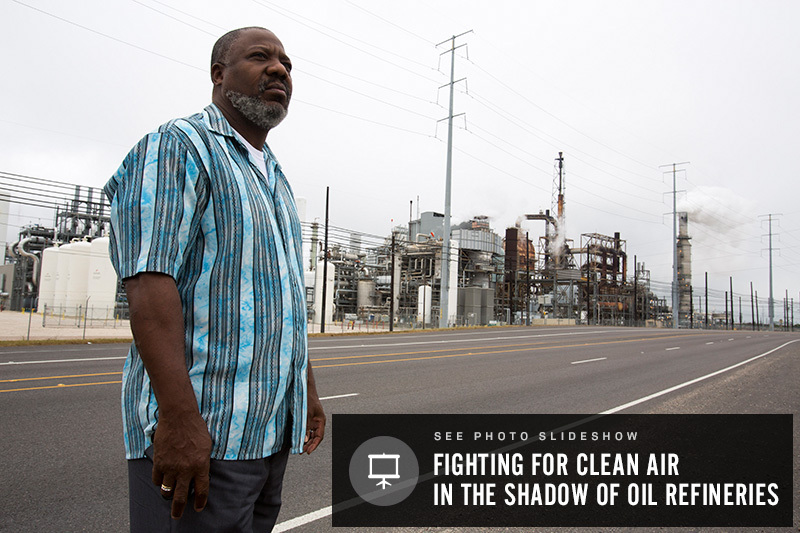 Jesse Marquez works to clean up oil refineries and chemical manufacturers surrounding his Wilmington, CA, neighborhood. 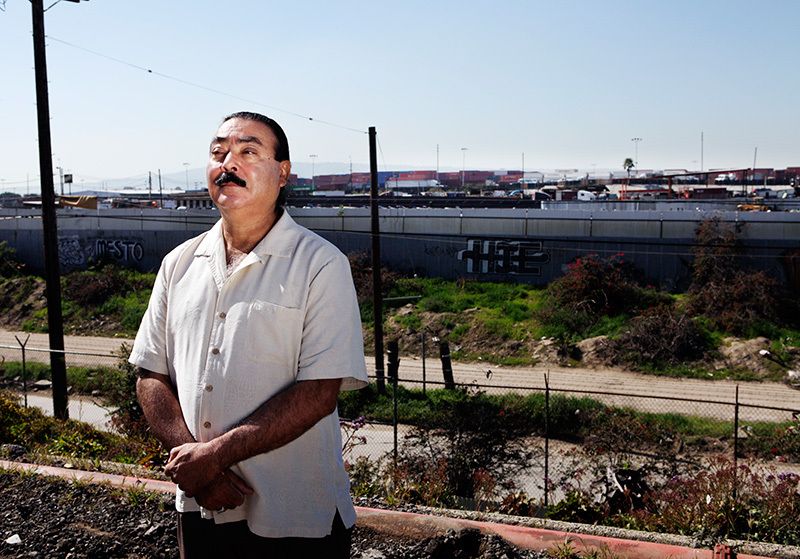 Unlike Kelley—who was guided by a dream—Marquez's activism came from a near-death experience. Forty years ago, the Fletcher Oil refinery across the street from his house exploded, knocking the then 16-year-old Marquez and his family off their feet. "It was just like you see on TV and war movies when they show an atomic bomb going off," Marquez says. "There was chaos all over." A second explosion sent a huge fireball across their house, dropping a giant metal storage tank in the middle of their street. The explosion killed five and injured 154. Marquez remembers running down his street, jumping over a fence, and the cries of a woman trailing him from behind. "As I lifted my brothers and sister over the fence and then I jump over and I'm getting ready to take off I hear a voice calling me," Marquez recalls. "She said, 'Boy, boy please turn around.' I turn around and there's a woman with a baby in her hand, about six or seven months old. She is burned, the baby's blanket is burned, the baby's face is burned. She says, 'Please save my baby.' She throws the baby over the fence like a football for me to catch." "So that's the day that made me what I am—to this very day I'm still an activist," he said. Marquez founded the Coalition For A Safe Environment in Wilmington, becoming a one-man crusader to clean up the oil refineries and chemical manufacturers that surround his neighborhood. But, like Kelley, Marquez was discovering the need for more help at the federal level. In 2012, Earthjustice and the Environmental Integrity Project sued the Environmental Protection Agency in federal district court on behalf of Kelley, Marquez, their organizations and other community groups in Texas, California and Louisiana to establish long overdue health and environmental protections from oil refineries. These refineries disproportionately impact low-income communities and communities of color, who have to bear an unfair burden of higher rates of cancer, asthma and heart disease. 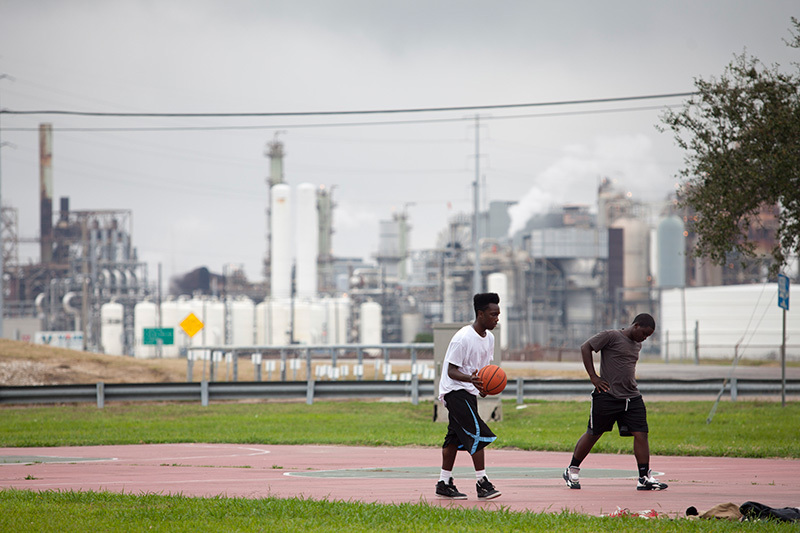 Teenagers play basketball in the Carver Terrace housing project in Port Arthur, TX, in the shadow of an oil refinery. In February of 2014, a federal judge issued a consent decree requiring the EPA to review and update the standards controlling hazardous air pollution from refineries. Three months later, in May, the EPA released the draft rule and started the public comment period. The EPA is now in the process of updating its rules that regulate refinery pollution, and is scheduled to finalize an updated rule by April 2015. "This is an important first step. Now, the EPA must listen to the voices of fenceline communities in this rulemaking and finally set strong limits to cut refineries' toxic air pollution," says Earthjustice attorney Emma Cheuse. Aside from their success in getting the EPA to take important new action, Kelley and Marquez are seeing their efforts rewarded in other ways. In 2011, Kelley was awarded the Goldman Environmental Prize, the nation's most prestigious environmental award. And Marquez has successfully stopped more than a dozen projects in Long Beach and Los Angeles that would have brought more pollution and more health threats into Southern California. The key for both men was embracing their hometowns and fighting like hell to protect them. Says Hilton: "I've been all over the world twice; there is no place like Port Arthur, Texas. These refineries are not going to contaminate our community, are not going to dismantle it, and are not going to destroy it. They are going to adhere to the law." Above: Hilton Kelley, community activist and Goldman Prize winner, in Kelley's Kitchen at Port Arthur, TX. – Hilton KelleyOn the need to clean up air quality in Port Arthur, TX. Kelley was awarded the 2011 Goldman Environmental Prize for his work.